This page is designed in the style of a Philadelphia & Reading Railroad advertizement from the 1920s. 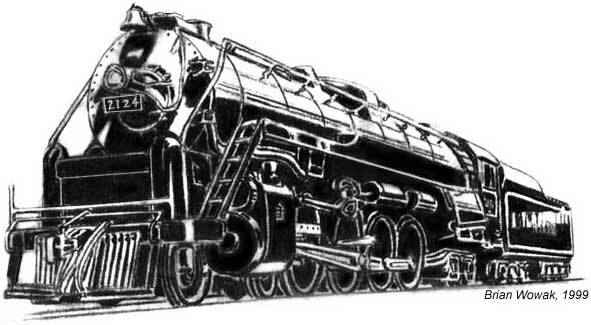 Special thanks to James L. Holden and his books, The Reading Railroad: History of a Coal Age Empire, Volumes I and II. This site's intention is to foster awareness of the historical value of Reading Company T1 class 4-8-4 number 2124, for the purpose of gathering support for the restoration to active service of 2124. Restore 2124 is in no way affiliated with Steamtown National Historic site, Steamtown NHS Volunteer Association, or the Lackawanna & Wyoming Valley Railway Historical Society. This site is designed, created and run by Brian Wowak. This site is optimized for 800x600 pixel resolution.